On Tuesday, May 30th 2017 L-Tron was honored to deliver our Cuddle Bear Books and Bears Donation to City Hall. 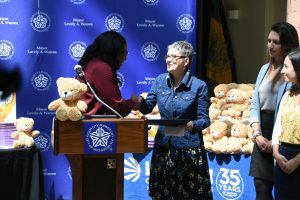 Mayor Lovely A. Warren accepted the donation of hundreds of teddy bears and children’s books for the Books and Bears Program for the Rochester Police Department. 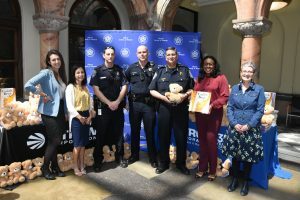 Books and Bears collects donations of new children’s books and stuffed animals, which patrol officers carry in their cars, to give to young children whom they might encounter at a crime scene or some other traumatic life event. The books and bears are able to build trust between the Officers and children, and are also meant to foster reading and literacy in the community. 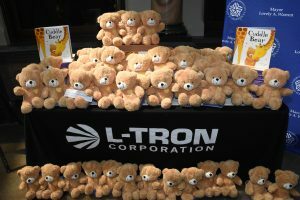 Earlier this year, L-Tron kicked off a fundraising campaign to buy teddy bears and children’s books for the Books and Bears Program. The drive raised about $3,400 to buy hundreds of books and bears. The drive was organized by L-Tron employee Carmella DeRose, who is also a consultant with Usborne Books and More, a national distributor children’s books. For every two sets of books and bears donated, Usborne donated a third to the program. Visit www.cityofrochester.gov/booksandbears to learn more about the Books and Bears program, and the impact it can have on the Rochester community.